Memrise or Duolingo: which is better for language learning? 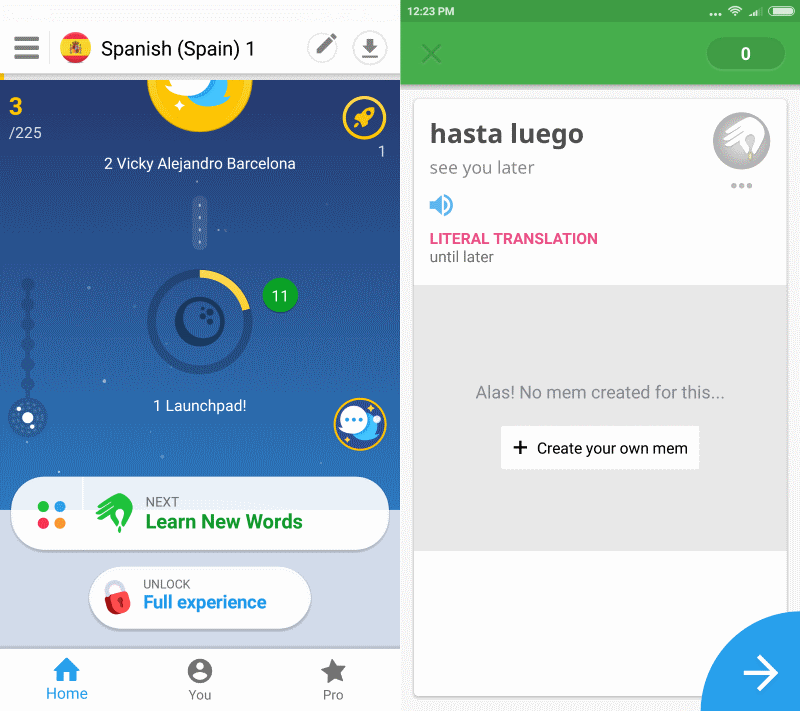 Memrise and Duolingo are two language learning services that are both free to use, and available for various platforms including Android and iOS. If you want to learn a language, one option that you have is to use an application for that. Apps offer several advantages over language cassettes, tapes, CDs or books. Probably the most important ones are that they are interactive, that you can take them with you wherever you go, and that you can learn different languages using them usually. But if you want to use an application, which should you choose? Two popular choices are Memrise and Duolingo. We start with a review of both services individually, and compare the features and functionality of them afterwards. 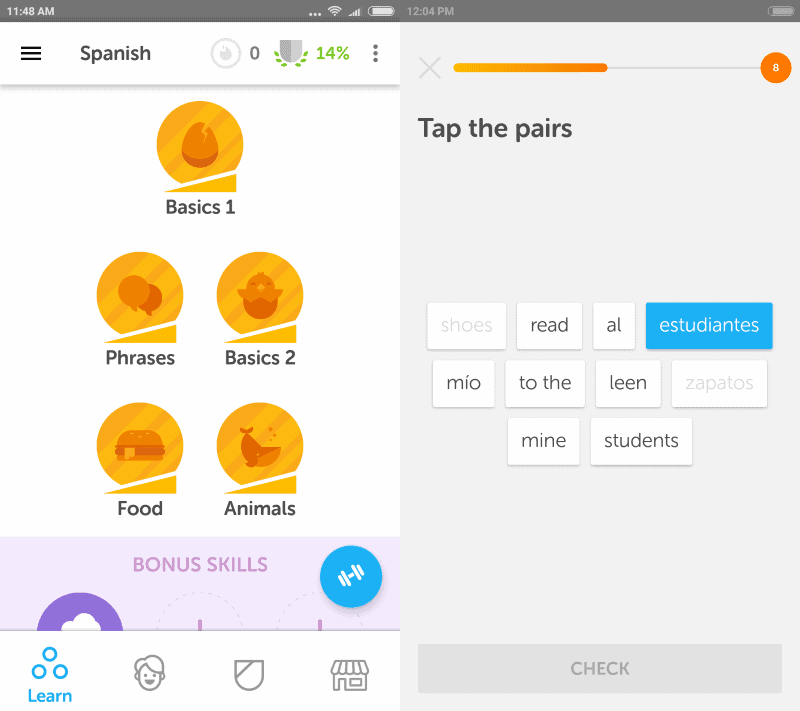 Duolingo supports 23 languages currently, among them French, Spanish, German, Italian and Portuguese. The service supports several instruction languages, but not all supported languages are usually available. German speakers may only learn English, Spanish and French for instance, while English speakers have access to all target languages supported by Duolingo. You may set a goal during account creation which ranges from casual to insane. These are not difficult to reach, and should not take longer than 30 minutes a day even on the insane level. Duolingo uses a progress based system that is based on topics. You unlock new topics, phrases, food, or possession, as you progress and complete previous topics. Most topics are made up of multiple lessons, and a training part in the end. You need to finish all lessons to complete a topic, and may run the training part at any time. Lessons mix various methods, for instance translations from and to the language you are learning, multiple choice questions, listening and speaking exercises, or matching pairs. The app focuses heavily on words and the translation of phrases or sentences. All words and phrases of the language that you are learning are spoken, so that you get to know the pronunciation as well while you learn. One downside of using Duolingo is that its focus on words, phrases and sentences ignores grammar for the most part. While you pick up some while you learn, for instance the use of articles, plural, declension, or tenses, it is not as easy as learning those in groups. Another downside is that some of the sentences that you translate don't make a whole lot of sense, and that you will never use others ("Yes, the cat eats ducks", "I'm a duck. I speak English", or "Yes, we are cats".) You are bombarded by ads after every lesson on top of that. Memrise supports over one hundred languages, and even other topics that you may learn. Among the popular languages are the same that you may learn using Duolingo, but also others such as Japanese (coming soon to Duolingo), regional languages, e.g. Spanish (Mexico), or Arabic. Memrise focuses heavily on learning words and phrases. Lessons begin usually with a couple of new words or phrases. These are pronounced, translated, and you may add your own "mem" to them to better memorize the word or phrase. The app uses multiple choice, translations that you type, or understanding what native speakers say. One strong feature of Memrise is that it ships with native speaker videos. This means that you will listen to a wide variety of native speakers while you learn the language. Free users gain access to three of the six different language learning modules, while pro users access to all six of them. The three free modules are "learn new words", "classic review" and "speed review". You learn new words in the first, strengthen already learned words and phrases in the second, and play a game of "quick answer" in the third. Memrise pushes its Pro service as much as Duolingo pushes its. Which should you pick? Duolingo or Memrise? The answer to the question may surprise you. First of all, it depends on the language that you want to learn. Duolingo does not support as many languages as Memrise so that you are left with Memrise as the only option in those cases. If both support the language, I'd suggest you use them both. The benefit of doing so is that you are exposed to different learning methods, pronunciations, and systems. Memrise focuses a bit more on words and phrases, while you learn that and sentences when you use Duolingo. If you are in a hurry, you are probably making faster progress when you are using Memrise, as you learn conversational skills in the beginning for the most part. Both are not super useful when it comes to grammar though. As far as pro versions are concerned: you can get a Memrise Pro subscription for €23.50 per year, or a lifetime payment, and Duolingo Plus for €10.99 per month. Both paid versions support offline access to the app, and an ad-free environment. Memrise adds access to the Pro only learning modules which improve the app significantly. Now You: do you use apps to learn languages? If so which and why? Duolingo es una aplicación fenomenal y da una formación satisfactoria. I like Memrise best, Duolingo is a close second and I like Busuu the least. For Mandarin there is a good app called ChineseSkill. I started with Duolingo, but like Memrise a bit better right now. I just started using Duolingo for Turkish, and find it quite useful. I have not been bothered by ads. Moreover, below each phrase the is a “discussion” button, which gets you to a forum where you can ask a question; it might take 1-2 days to get an answer, but you do get one. Also, some of the exercises involve listening to a word or a sentence being pronounced. You have 2 speed choices: normal speaking speed, and slow speed. Very useful. Cant find the pro subscription for €23.50. Or the lifetime payment. Any hints how to get them? I’m getting a popup for the offer when I open the Memrise app, and when I click on the pro link in the bottom right corner. You see the link on the second screenshot on the left side. Thanks, was looking on the website. The great Either/Or fallacy that makes one assume there is no choice when choosing options for learning a new language other than this/that. Research: How do we learn a new language? What sources are available to me? Hmmm . . . Duolingo or Memrise? That’s it? Flip . . . Martin learned German via Duolingo and Memrise apps which is why his blog is in English, right? And about 1,000 other sources, apps, and means. Jasray, right, there are plenty of options. I’m not saying that either Duolingo or Memrise are the best for your learning situation. Yes, sorry; I don’t feel right about the tone of my Reply. I guess I am used to your usual plethora of options and reviews of the pros/cons of each. “Mi Vida Loco” on BBC is good for Spanish. I am trying and find information on the pricing of Memrise subscription, because I have just been charged $59.0 by an automatic payment even before the next cycle date (February 2018), at a time when I actually was considering cancelling my subscription, but was waiting to get closer to that date. Can you please help me by pointing me where I can find that pricing information? I’ve used Duolingo on the Web site and iPad app and never seen an ad. Is that something new? I thought they made money by selling translation services using language learners to train it, or something like that. Alan, I only use the app on Android, never used the web version of Duolingo. Maybe it is without ads? if i buy a pro version of memrise app , will i get access to the pro version of all the languages in app or will i just get it for one particular language? When you subscribe to Memrise Pro, you get access to additional features for all languages that support it.